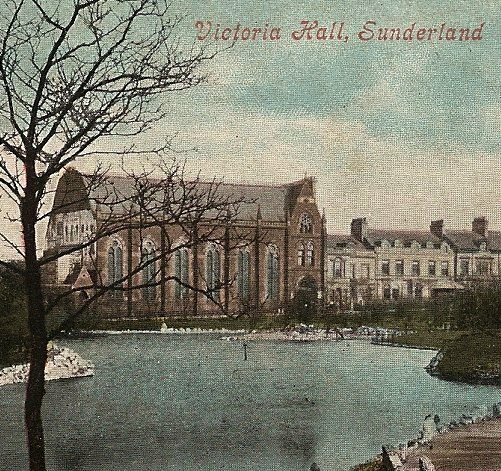 In the 19th century the Victoria Hall facing Mowbray Park in Sunderland was a popular venue for public meetings and entertainment. The large hall offered seating on the ground floor, the first floor, the dress circle and the gallery. On 16 June 1883 at 3p.m. approximately 2000 children between the ages of 4 and 13 years gathered to see a show by travelling entertainers from Tynemouth Aquarium. 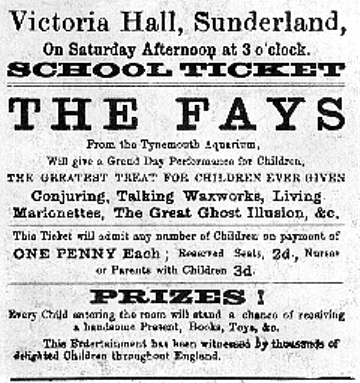 It had been advertised as the Greatest Treat for Children Ever Given and offered free presents to ticket holders with the winning lottery numbers. These gifts were being handed out on the ground floor and eager not to miss out a mass of children began to stream down a narrow winding stairway 6 feet wide which descended from the gallery to an exit door that had been wedged open and bolted into the floor to facilitate ticket redemption and restrict passage of children one at a time. However, the surge of children knocked over those in front while the ones behind continued to push forward. 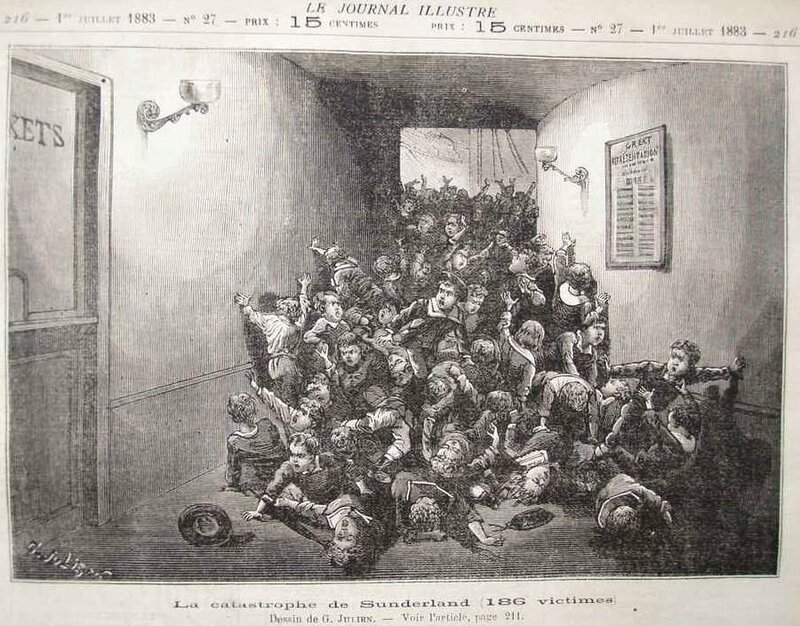 The children at the bottom of the stairs were crushed and trampled. Records show a total of 202 children were asphyxiated in the tragedy. A hundred more were injured. A few of those who were lost included an entire Bible class of 30 children from a local Sunday school, and the Vills family who lost four children. Catherine Richmond, aged 7 years, survived the disaster but died from fright immediately following. 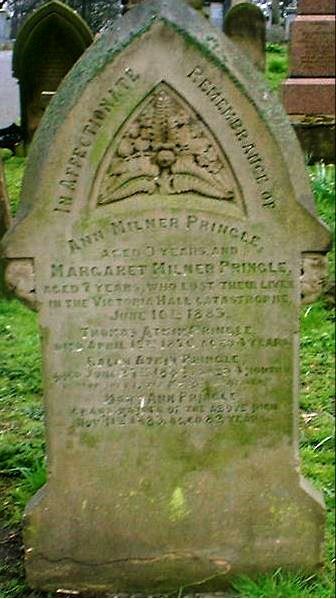 Ann Milner Pringle was 9 years old and her sister Margaret Pringle aged 7 years old. In affectionate remembrance of Ann Milner Pringle aged 9 years and Margaret Milner Pringle aged 7 years, who lost their lives in the Victoria Hall catastrophe June 16th 1883. Symbolism of the fern on the gravestone represents new life. William Johnson aged 10 years. Not my will Lord but thine be done. 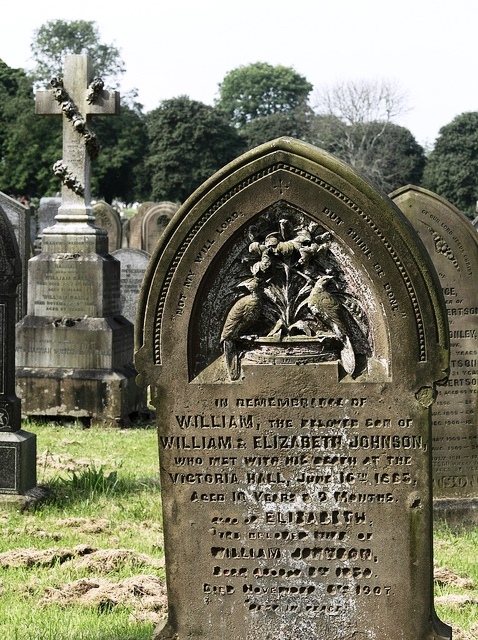 In remembrance of William, the beloved son of William & Elizabeth Johnson, who met with his death at the Victoria Hall, June 16th 1883, aged 10 years & 9 months. Symbolism of two birds is eternal life, and the lily represents innocence and purity. Charles Foster aged 8 years. 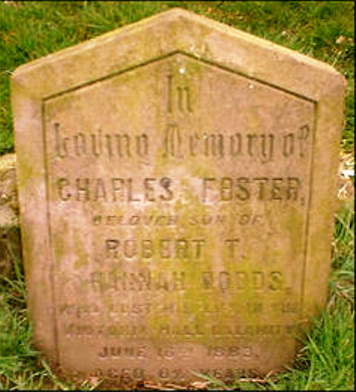 In loving memory of Charles Foster beloved son of Robert T. Hannah Dodds who lost his life in the Victoria Hall catastrophe, June 6th 1883 aged 8 years. John Howard aged 11 years. In loving memory of John, son of William & Henrietta Howard who was killed in the Victoria Hall disaster, June 16th, 1883 aged 6 years 11? months. Eliza Halliman aged 9 years. Beloved daughter of John and Mary Ann Halliman who departed this life through the fatal Disaster at the Victoria Hall, June 16th, 1883, aged 9 years. In the midst of life we are in death. The janitor and several adults made an attempt to rescue the crushed children and redirect others to another exit. The bodies were laid in the ground floor of the hall where doctors tried to resuscitate. The streets filled with families and onlookers. The screams of terrified parents were silenced an hour later when a procession of cabs transported families with their dead children back to their homes. All homes closed their drapes and local businesses closed as a mark of respect as the children were buried over the following four days. A memorial fund, a donation by Queen Victoria and public donations from all over the country paid for the funerals, and the remaining balance was to be used to purchase a memorial. The dead were buried in Bishopwearmouth Cemetery, Mere Knolls Cemetery, Holy Trinity Churchyard, and Sunderland Cemetery where the graves were dug in three rows the centre of which was reserved for placement of a memorial. A memorial of a life size white marble statue depicting a grieving mother holding her dead child was erected in Mowbray Park. 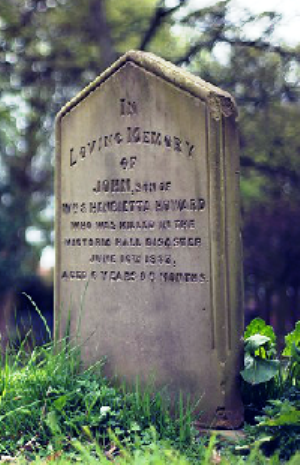 It was later moved to Bishopwearmouth Cemetery where it gradually fell into disrepair, and was vandalised. In 2002 the marble statue was restored and returned to Mowbray Park with a protective canopy. Two inquiries were held but no one was held accountable. As a result of the disaster Parliament passed a law that required all entertainment venues to have bar-operated exit doors that open outwards. This law is still in effect today. The hall remained open for decades after but was destroyed by a German bomb in 1941. The following links give detailed reports of the accident from newspapers in London, England; New York Times, USA; and Lauceston, Tasmania. 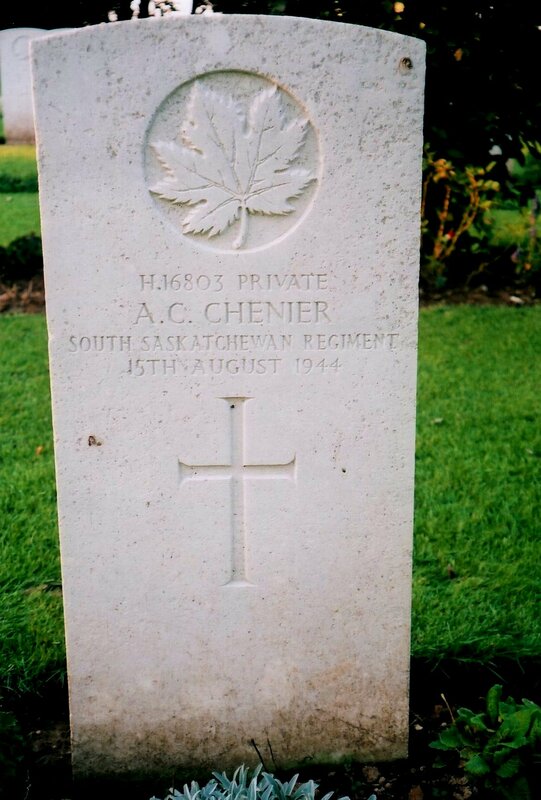 We are in Normandy, France, to search for the grave of Albert Chenier, a Canadian soldier who gave his life in support of freedom. We know he died here, but little else. We visit the Juno Beach Centre at Courseulles-Sur-Mer (a museum commemorating the Canadian liberation forces efforts, and a memorial to their lives.) We explain to the Guide that we have been searching the names on the memorial in the grounds for Albert Chenier who was injured upon landing and died several weeks later. He informs us that the names on the monuments are sponsored, and they do not represent all the Canadians who died there. 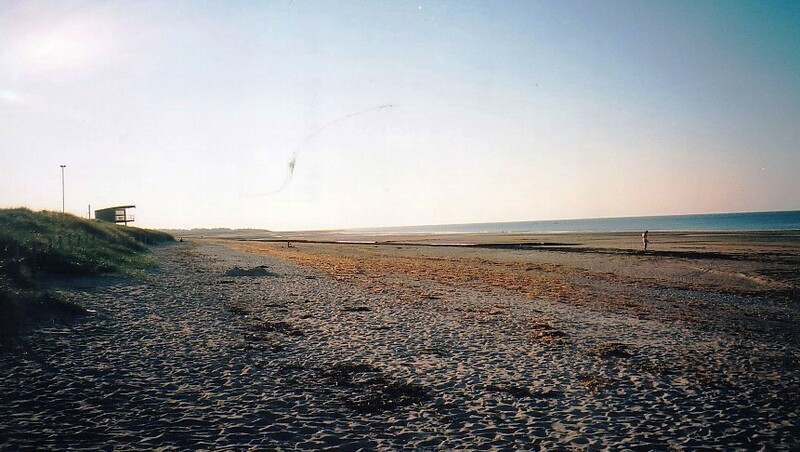 He offers to search the website and returns within a few minutes with Albert’s regimental number and the cemetery in which he is interred, only a few minutes from this location: Beny-Sur-Mer Canadian War Cemetery, Calvados, France. The cemetery was created as a permanent resting place for Canadian soldiers who had been temporarily interred in smaller plots close to where they fell during World War II. 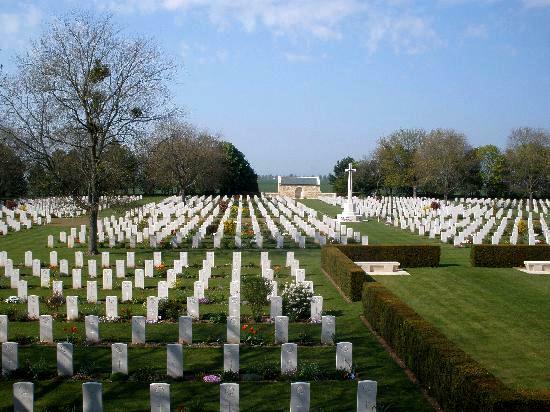 It contains the remains of 9 sets of brothers, a record for a Second World War cemetery. There is also a special memorial erected to a soldier of the Canadian Infantry Corps who is known to have been buried in this cemetery, but the exact site of whose grave has not been located. We follow directions to a large cemetery located in the middle of the open countryside where fine hedges decorate the entrance. The flanking registry buildings have platforms from which visitors can see the whole area, and they also house a tabernacle containing a guest book and a list of all the buried soldiers. Although 2048 headstones stretch out in pristine rows enclosed by pines and maples marking the dead of the 3rd Division and the graves of 15 airmen, it is a simple feat to find Albert’s grave thanks to the schematic of the cemetery. 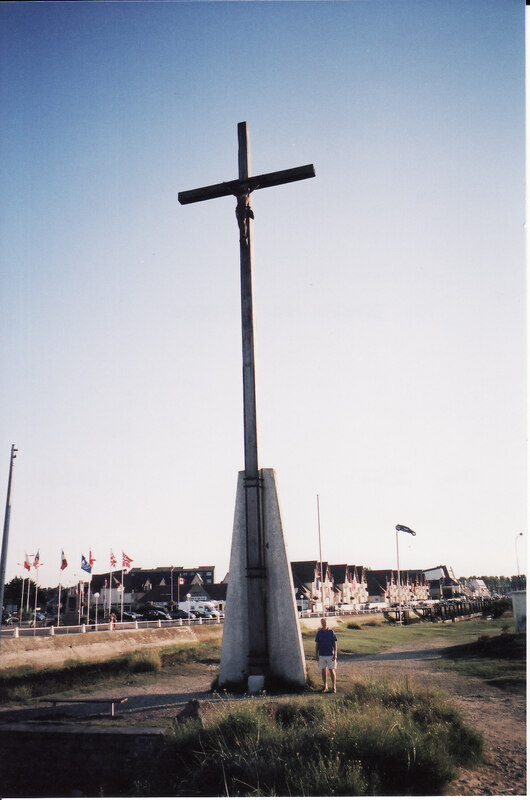 As is typical of war cemeteries in France, the French Government granted Canada a perpetual concession to the land occupied by the cemetery. Local school children tend the graves and each is marked by flowers. It is a humbling experience to be present in this hallowed place and to read the inscriptions on the graves of so many young men. Grave Reference: IV. F. 5. H/16803, South Saskatchewan Regiment, R.C.I.C. He died of wounds in France on 15 August 1944 and is remembered with honour. Peace, perfect peace – June 9, 1944. May we be worthy of his supreme sacrifice. You died for your country like a hero brave.